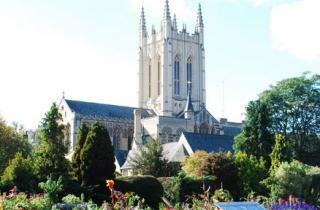 This year Holocaust Memorial Day will be commemorated musically for the first time at St Edmundsbury Cathedral. At 6 pm on Sunday 27 January, there will be a solemn concert featuring a Requiem for choir and string quartet composed by St Edmundsbury Cathedral Organ Scholar, Thomas Hawkes. This is free to attend, with a retiring collection. In addition to this, on Monday 28 January, at 10.30 am, there will be a service of words, music and prayers at the Holocaust Memorial Garden near the Abbey Gate in the Abbey Gardens, Bury St Edmunds. This service will be led by Canon Matthew Vernon, Sub Dean of St Edmundsbury Cathedral, who will be joined by school students and civic representatives. On 4 February at 7 pm, there will be a lecture entitled ‘Torn from Home’ in the Edmund Room, Cathedral Centre. This will be given by Dr Jennifer Craig-Norton from the Parkes Institute for the Study of Jewish/non-Jewish Relations at the University of Southampton. The lecture will also feature reflections by Rob Thompson, Senior Programme Manager at the Council for Christians and Jews and Sarah Geileskey, Yad Vashem Senior Clergy Seminar Alumnus and Cathedral Ordinand (priest in training). This is free to attend with a retiring collection. Visitors can also reflect on this period by viewing the exhibition in the Cathedral Cloisters, ‘Torn from Home: Keeping the Memory Alive’, which runs from 25 January to 4 February and features a series of reflections presented alongside entries from the 2018 Poster Design Competition run by United Nations Outreach Programme in conjunction with Yad Vashem’s School for Holocaust Studies.